BrickWarriors is now open and we offer a number of castle accessories that I thought you guys might enjoy. EDIT: We are now shipping to everywhere in North America, South America, and Africa. Resellers in other places around the world will be up and running in the next few weeks. Last edited by thrash on Mon Jun 17, 2013 6:21 pm, edited 2 times in total. Nice. I ordered a few of the axes and some armor. Looking forward to getting them. EDIT: Received my order. Here are a couple photos to show off some of Hobo Jr and my stuff. I was very excited to see that you're now shipping to Canada, and subsequently equally excited to place my order today. Now, I'm quite looking forward to its arrival. It is quality stuff. I recently reviewed them on The Brothers Brick and I really liked them. The armor that Hoboman has in his pics is what excites me the most about these. but they all look real cool. All I need now is some spending money. My order (two-handed axes, swords, funky helm) arrived this morning, and I am very, very happy. Each of the pieces appears to be perfectly compatible with minifigure hands and heads, but each seems to be just a little more substantial that Lego's own accessories. I really like this. Each piece has great detail without being delicate, and they look like they could stand up to heavy play. Overall, I would really recommend these. 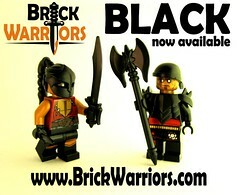 I'm happy to announce that the entire BrickWarriors product line is now available in black from our bricklink store! The minotaur head (not pictured above) is also available in black. Black seemed to be the most requested color for these accessories, so that's why I ran the molds in black. Is there any other color you guys would like to see these in? Re: BrickWarriors Available in Black! Awesome! I'll have to pick up some of the black fantasy armor now. As for other colors, silver/white, Gold, maybe rusty brown. Can't think of anything else at the moment, but I'd definitelybe interested in those colors, especially if they had a metallic tinge. BrickWarriors - 21 New Items! 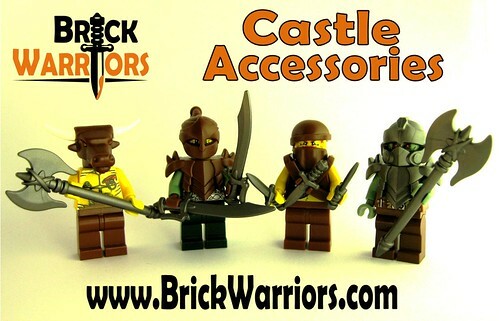 I'm pleased to announce that BrickWarriors now has 11 brand new castle-themed accessories available, including a Spiked Mace, Skull Crusher Warhammer, Fantasy helmets, and more! 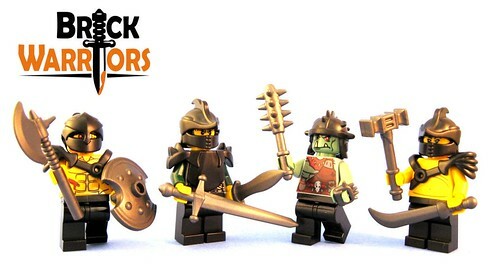 All of these items are availabe on the BrickWarriors website. Re: BrickWarriors - 21 New Items! whoa...cool! Love me those helmets, and the axe is awesome! I've bought things from you in the past, and it looks like I'll be placing another order. Wow! These new pieces all look great, especially the spiked mace and the hammer! I don't want to press you and I'm happy to wait, but I'll toss in my colour request here. Handar wrote: I've bought things from you in the past, and it looks like I'll be placing another order. Wow! These new pieces all look great, especially the spiked mace and the hammer! All of the weapons in the photo are steel, but the color was thrown off a bit when I was editing the photo. Sorry that it was misleading like that! That being said, I am working with my manufacturer to get a color similar to what it sounds like you're looking for. I can't say exactly when it will be ready, but it shouldn't take more than a few months. thrash wrote: All of the weapons in the photo are steel, but the color was thrown off a bit when I was editing the photo. Sorry that it was misleading like that! Thanks for the quick reply. I'll wait patiently for updates while you work things out with your manufacturer. The steel looks nice, but to have a colour like that displayed in the picture would suit my tastes even more. Still, this is great work. I'm really impressed. Wow! Nice weapons! The shield in particular! I've never seen anyone make that style before! the gladius is great too! they do appear bronze in the picture, and steel is good and all, but bronze would be awesome! 1 question. the steel color, is it like Flat silver on bricklink? Yea I really like that mace and axe. Mace because thats my favorite medieval weapon and there is not really any good Lego example of mace. I been just thinking how to make a custom spike mace of my own.